Country Manager Enda Corneille said deal ‘brings Emirates brand much closer to home’. Emirates has announced a deal to serve Butlers Chocolates to First Class customers on board all of its flights. An estimated 50,000 Butlers luxury chocolate bars per month will feature cabins’ goodie baskets from the end of this month. The airline, which has partnered with a number of Irish brands including Keogh’s crisps over the past 18 months, selected a variety of flavours from the Butlers signature solid chocolate bar collection, including Mixed Berries white chocolate and Honeycomb Crisp milk chocolate. Emirates’ Country Manager Enda Corneille told Travel Extra at the launch in Butlers Chocolate Café on Dublin’s Dawson Street that “with Irish cabin crew, Irish pilots and now with Irish products onboard it brings the Emirates brand much closer to home. The airline employs around 500 Irish staff including pilots and cabin crew based in Dubai. 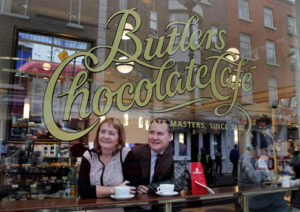 Butlers Chocolates began in Dublin’s Lad Lane in 1932 and is now available in more than 30 countries. The business employs over 400 staff in its Clonshaugh head office and production facility in north Dublin, and in Butlers Chocolate Cafés. The deal followed a series of meetings at Bord Bia’s Marketplace International trade event in Dublin, earlier this year, at which 550 buyers from 50 countries met with Irish food producers. Butlers joins a long line-up of high-quality Irish brands with which Emirates Group is already working including Keogh’s Crisps, with an estimated 1m packets being served onboard annually. Other Irish products include VOYA, Killowen Yogurt, Jameson Irish Whiskey, and Gahan meats.